What Does the Arbitration Win Mean for the Knicks? 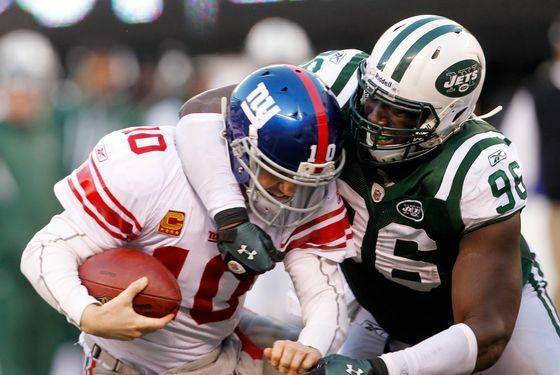 Most important thing first: Muhammad Wilkerson is all right. Wilkerson, defensive tackle for the Jets, collided with another vehicle and overturned his car on the New Jersey Turnpike very early on Saturday morning. He had to go to the hospital after climbing out of it, but only ended up needing a few stitches. He's okay, everyone from the other car is okay, and that's what matters most. Keep that in mind, and put that information first if you're ever in a minor accident and need to call your loved ones in the middle of the night. Once you've established that you're okay, you get to this part: Wilkerson was not found to have been driving under the influence or anything, but he was charged with careless driving (which a quick Google search reveals to be different from "reckless driving" in New Jersey and not a huge deal) and failure to stay in his lane. So, thankfully, there isn't much news to report here. Wilkerson, who was the Jets' 30th pick in 2011, should be good to go for training camp. He had a promising rookie season and figures to play a more prominent role in their defense this year. Minimal harm done, thank goodness. Be safe out there, everybody.